December 5, 2013, Montreal, QC—Effigis Geo-Solutions Inc., a leading distributor of Earth observation images, is pleased to announce it has signed an exclusive agreement to distribute satellite images from the Pléiades satellites operated by Astrium Services, a subsidiary of European giant EADS, global leader in aeronautics. 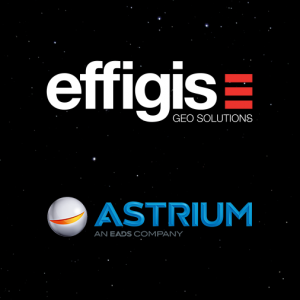 This agreement, reached with Astrium Services, North America Geo-Information Division, gives Effigis exclusive rights to the sale and distribution of Pléiades data of Canada to Canadian end users. In orbit at an altitude of nearly 700 km since they were launched in December 2011 and 2012, the Pléiades Earth observation satellites 1A and 1B can provide imagery products of the Earth’s surface with a resolution of 50 cm, which ranks them among the world’s highest-performance sources of very-high-resolution satellite imaging. With unmatched accuracy and quality, they make it possible to view landscapes in 3D and to extract a large amount of useful information from them in various fields: from land management, natural resource management and infrastructure monitoring to supporting emergency operations during natural disasters or catastrophes such as the one in Lac-Mégantic, Quebec, earlier this year, for which a series of Pléiades images were produced on a weekly basis to guide response measures on the ground. “With their growing number and the continually improving accuracy of their sensor, satellite images will be used increasingly in the future to feed the development and deployment of even more innovative technological solutions that will enable our customers in the numerous markets we serve to benefit from complete information they need at all times, across the planet,” added Mr. Vincent. “We’re proud to join forces with Effigis, whose expertise and experience in Earth observation is universally recognized, in order to develop the full potential of the Canadian market. We’re convinced that by combining the outstanding capabilities of our Pléiades data acquisition, processing and rapid delivery systems, we will achieve concrete results in the targeted markets,” said Greg Buckman, Head of Astrium Services’ Geo-Information team in North America. Astrium Services is the operator of the SPOT satellite family, the Pléiades and SPOT 6/7 constellation, in addition to holding the exclusive commercial operating rights for the high-resolution radar satellites TerraSAR-X and TanDEM-X. Astrium Services develops an extensive large portfolio of products and services spanning the entire geo-information value chain, from data acquisition and processing to data management and hosting, sophisticated geo-information services and turnkey integrated solutions.